How you feeeeling… hot, hot, hot! Most of the United States planted all their vegetable crops in the spring. We’re different in Florida. We do most of our cool weather vegetable planting in late September or October. I don’t even look at the “suggested planting times” on the back of seed packets anymore. 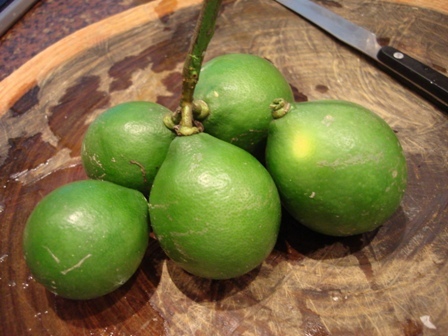 I have just learned what to grown in Florida and when. It’s definitely not an exact science. 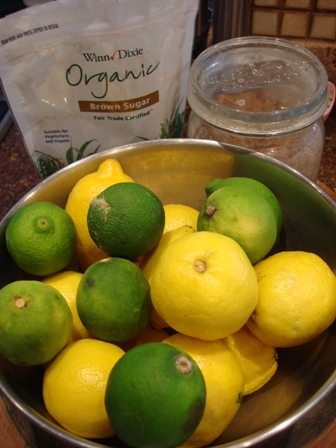 In late September I usually plant carrots, onions, turnips, strawberries, tomatoes, brussel sprouts, cabbage, corn, collards and lettuce. Most of these won’t grow well in the heat of a Florida summer… except the collards. Collard greens do grow in the summer but they taste much better when they’re grown in the winter and the frost makes them taste even better. Carrots will grow, but the heat makes them taste horribly bitter and yucky. 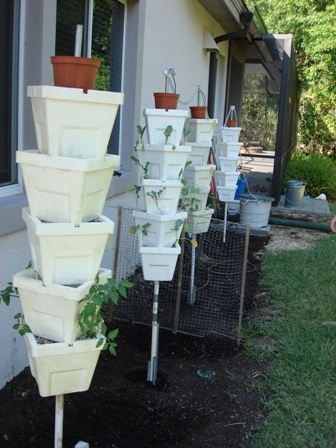 Tomatoes will grow too, but the heat prevents the fruit from setting. Cherry tomatoes are an exception and can sometimes take the heat. Lettuce is a cool weather crop that will bolt in the heat. “Bolting” is when the lettuce sends out a shoot that goes to seed. 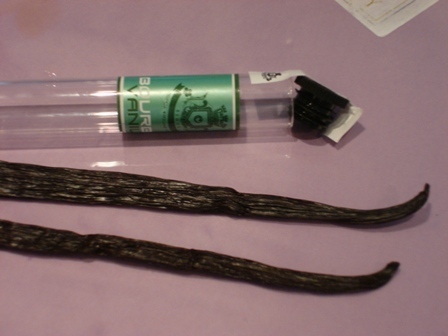 When a plant “bolts” it usually makes the leaves unpalatable. 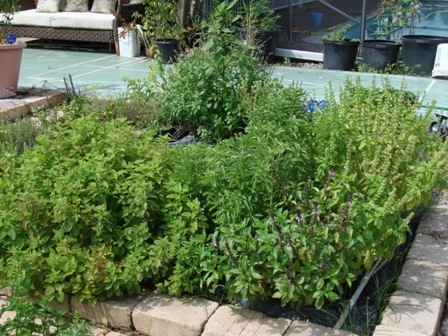 Herbs usually have a hard time surviving the heat in a Florida summer. If they’re grown in pots they can be moved into the shade. I keep my pelargoniums alive in the summer by moving them into the shade. Rosemary doesn’t mind the heat. 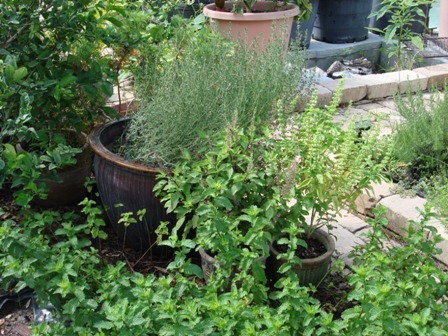 Lemon balm, lemongrass and cuban oregano thrive. I was glad to see my thyme made it through last summer without a problem. 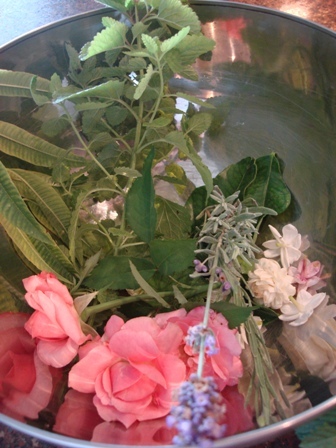 My new favorite is provence lavender. I have finally found a lavender that thrives in humidity. I’m going to plants lots more of this. 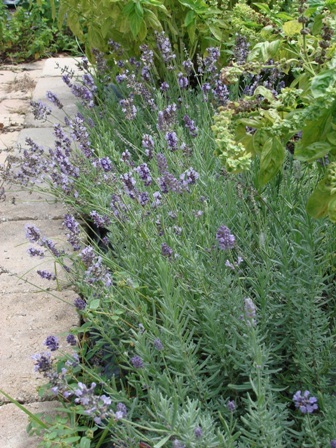 Provence lavender in a Florida summer (June). 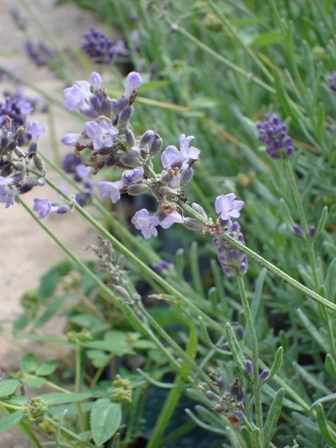 Provence lavender flowers that thrive in humidity and tolerate heat. 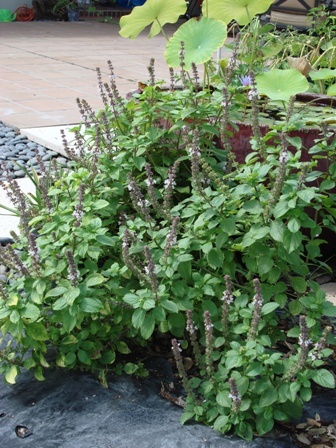 The African basil is thriving in the heat and the bees love it. 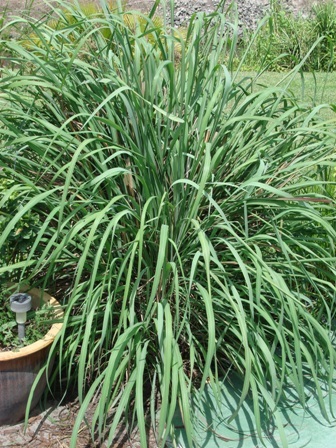 Lemongrass. I had cut it way back in March and it's full again. 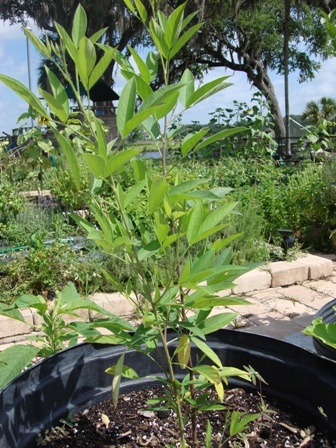 In the summer time in Florida we need to grow crops that can survive the heat and humidity. The problem with summer is the army of insects that usually arrive. 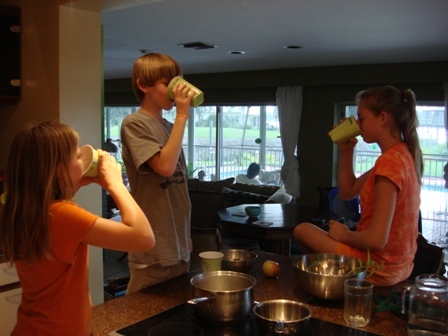 We’ve learned to tolerate them and we always figure out new ways to fight back without using pesticides. 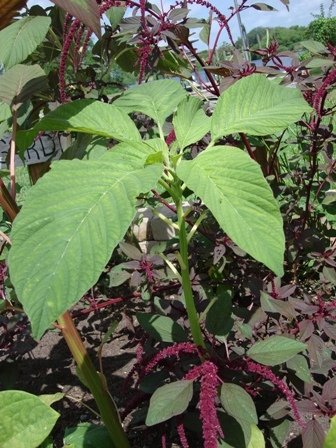 Our favorite summertime crops are callaloo, peppers, eggplants, okra, black-eyed peas, sweet potatoes, ginger, turmeric, chives, collards, cucumbers, watermelons, sugar cane, water chestnuts, sunflowers, malabar spinach and passion fruit. There are so many different varieties of these. We love the white eggplants and all the interesting kinds of peppers and watermelons. 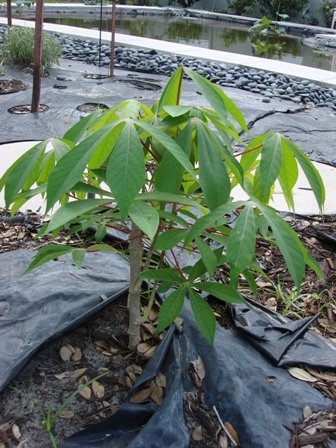 This summer we’re also growing cassava, malanga, different kinds of peppers, tomatillos and pigeon peas. 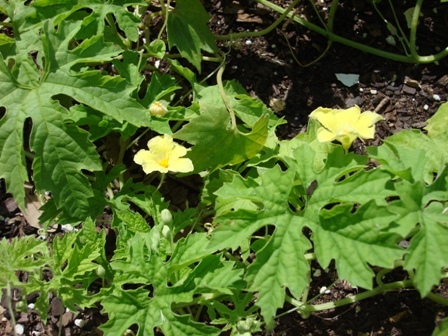 Bitter melon growing in a pot. 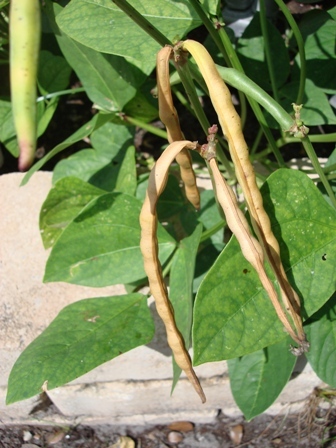 Dried black-eyed peas on the bush. 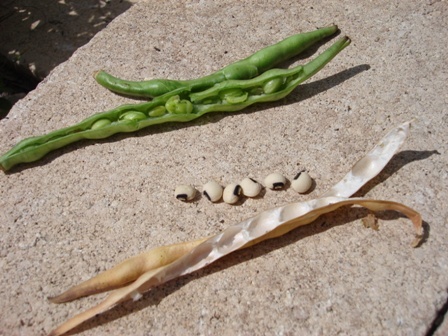 The top one is a fresh black-eyed pea "snap" and the bottom ones are dried black-eyed peas. Both make a delicious meal! 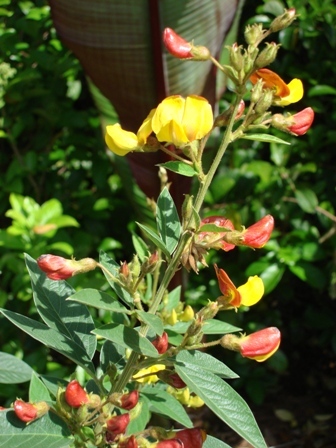 Young pigeon pea plant in a pot. 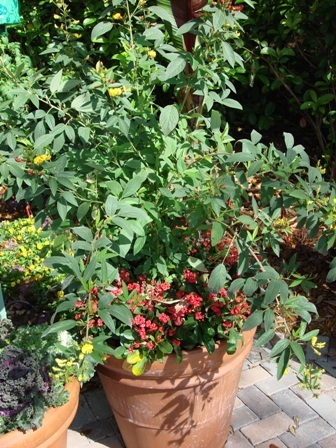 Large pigeon pea plant in a pot. 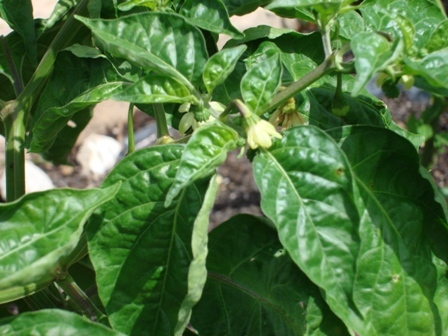 A scotch bonnet plant with a flower. 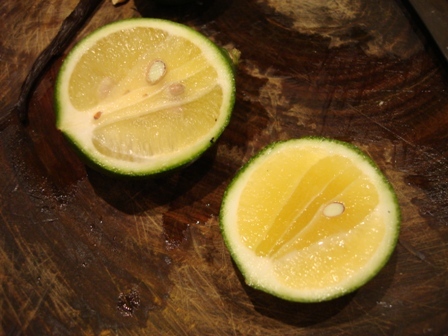 Scotch bonnet is a very flavorful and hot pepper. I cut off just a sliver and cook it with my food. 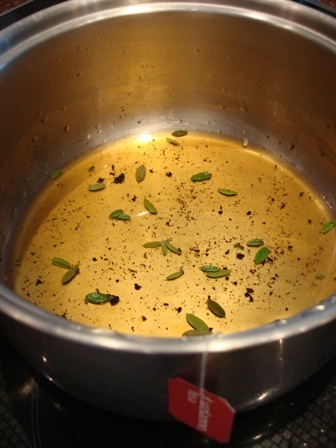 It adds delicious flavor and just enough heat. 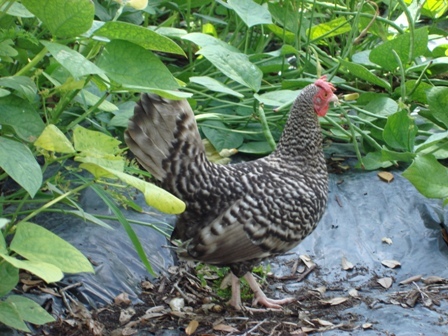 We’ve let the chickens loose around the yard for the summer and they are enjoying themselves immensely. They’re helping with the bug population and are able to find cool places to wait out the afternoon heat. They’re also taking a break from the egg laying which is necessary for them. This is our little bantam hen. Her name is "Sweet Pea" and she is hard at work foraging in the peas. 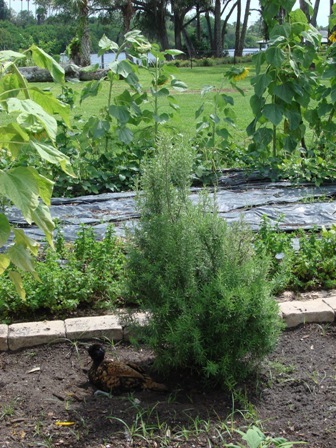 One of our floofy-headed chickens is chillin' under the rosemary bush. 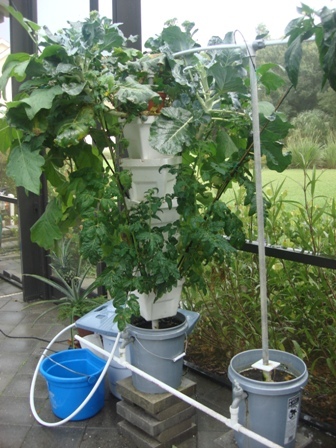 My dad set up a hydroponic garden inside his screened-in lanai last summer. It gets full sun but the screen provides some protection. The bees can’t reach his plants but he still got some gorgeous vegetables in the middle of summer. 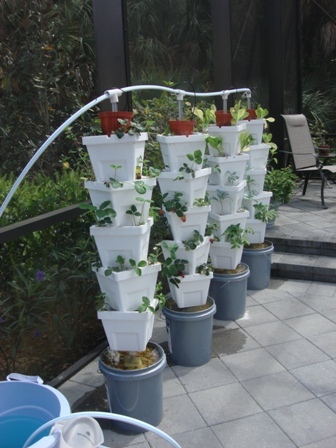 He also has a hydroponic garden set up outside the lanai. His garden changes constantly just like ours. It looks completely different every time we see it. My father's hydroponic garden inside his screeened-in porch. More of his inside hydroponic garden. His newly planted hydroponic garden outside of his screened-in area. 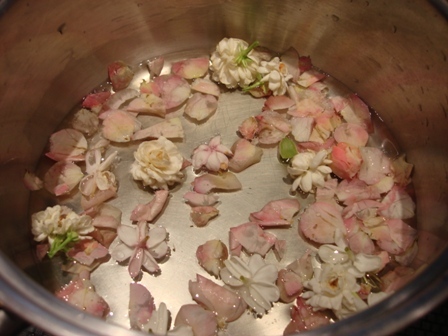 When the gardening experts tell me it can’t be done, I usually try anyway. Sometimes I’m successful and sometimes I’m not. Since I’m a backyard gardener and not a commercial grower, I have little risk in losing a crop or two. 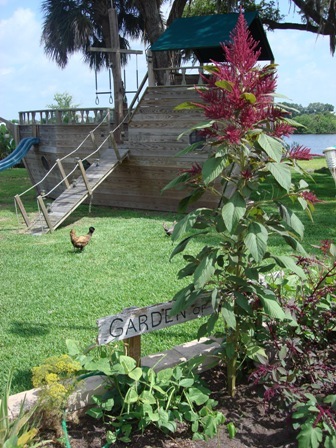 The beauty of Florida is that we can grow food all year round.